Special Collector’s Issue “Organic Gardening” mag worth checking out! For ORGANIC GARDENERS out there, or gardeners even CONTEMPLATING going organic, or maybe those only THINKING about trying gardening, this is the magazine issue you need to pick up – “Special Collector’s Issue: Organic Gardening”. Celebrating their 73rd year, this issue is a wonderful collection of great articles that are still relevant today! They will be changing the mags name to “Rodale’s Organic Gardening” and expanding content to include more than just gardening in future issues. 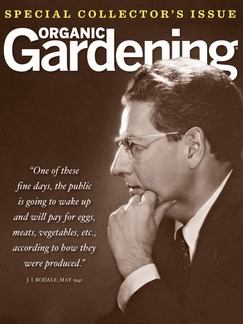 Did you know, when the magazine was first published in 1942, it was called “Organic Gardening and Farming”? Previous post ← They’re baaaaacckk! Slugs on the prowl.